The lack of gender diversity at high tech companies in the Silicon Valley has been the subject of much debate, but little progress. Few could agree on the diversity facts of record because no serious research had been done measuring how few women executives there are in comparison to their male counterparts. However, The Fenwick & West Gender Diversity Survey has nipped that research gap in the bud. 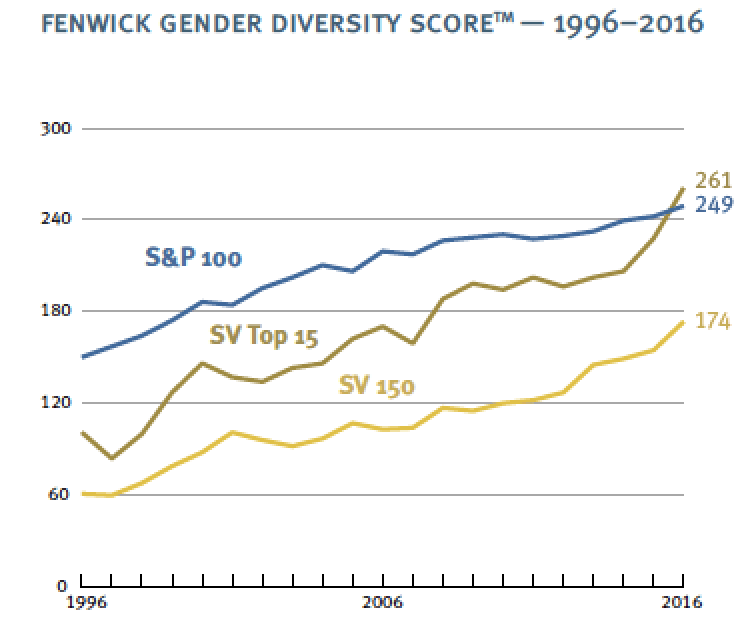 The firm’s landmark diversity research provides unique insight into women’s participation at the most senior levels of public technology and life sciences companies in the Silicon Valley 150 Index (SV 150). The diversity study compares SV 150 gender diversity levels to that of large public companies in the Standard & Poor’s 100 Index (S&P 100). The research analyzes the gender makeup of boards, board leadership, board committees and executive management teams in the two groups, with special comparisons showing how the top 15 largest companies in the SV 150 fare, as they are the peers of the large public companies included in the S&P 100. 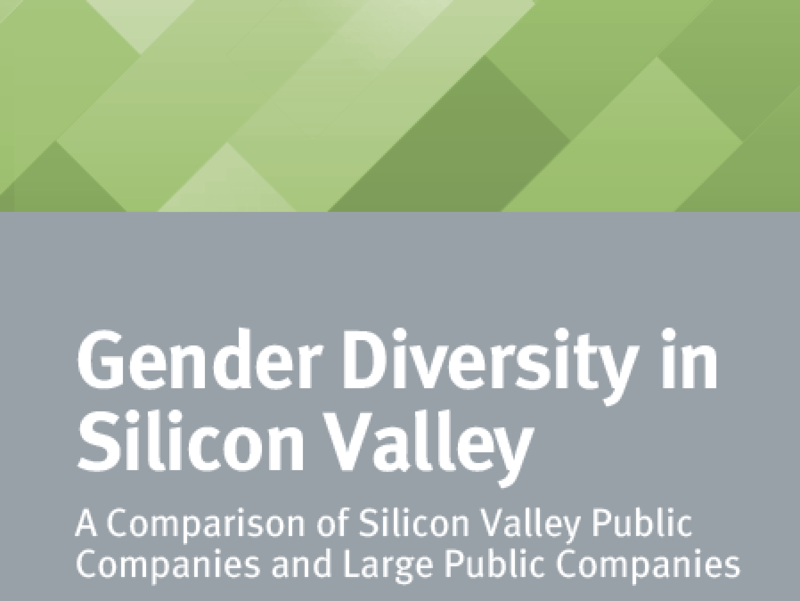 Their latest report Gender Diversity in Silicon Valley A Comparison of Silicon Valley Public Companies and Large Public Companies reviews data from public filings from 1996 through 2016. In the SV 150, the study found that between 2014 and 2016, the percentage of women on boards increased 4.1 percent to 14.1%. In the S&P, the percentage of women rose 2.2 percentage points to 23.1%, which brings us to another insight from the SV 150 Gender Diversity research. The latest survey indicates that company size continues to matter; the bigger the company, the more diverse its leadership. Diversity numbers for the top 15 largest companies in the SV 150 are generally closer to—and in some cases exceed—those of the S&P 100. Just 6% of the CEOs in the SV 150 are women and just 7% of the CEOs of the S&P 100 are women. While those numbers are nowhere near the 50% of women in the general population, they slightly exceed the percentage of women CEOs in the general corporate population (approximately 4%). “This composite score is based on data at the board and executive management level in the SV 150, top 15 of the SV 150, and S&P 100 over the 21 years surveyed and in a set of categories selected as representative of the overall gender diversity picture.” While numbers were flat in some years, clearly progress is being made. 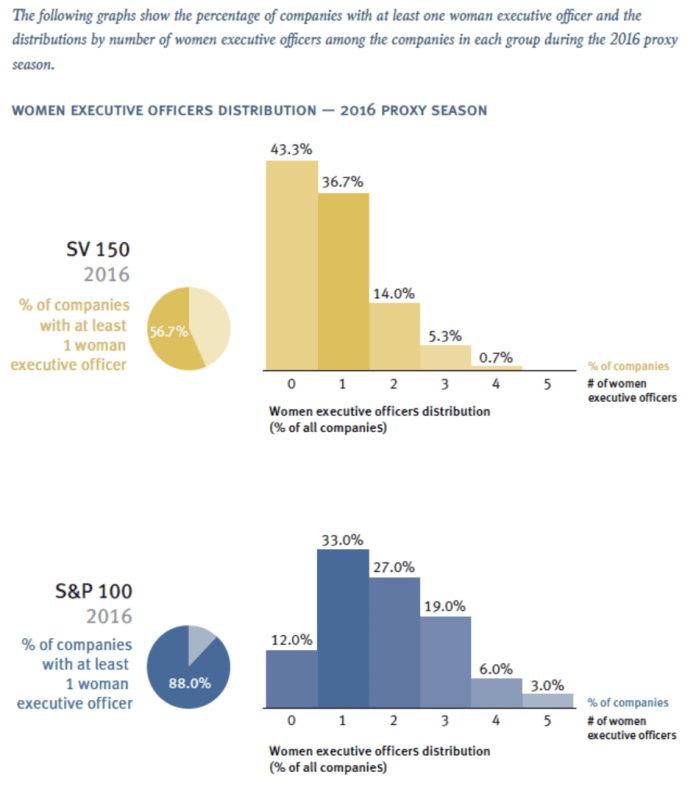 Yet, when you look at the chart below and realize 43% of the companies in the SV 150 have no women executive officers, it is clear the playing field is not level. The Silicon Valley 150 companies are public companies, mind you, not tech startups. They each have, on average, 8500 employees. S&P 100 companies average 170,000 employees. However, when you compare the two, SV150 companies seem as immature as a schoolboy who punches a classmate in the arm to show her how much he likes her. A programmer who breaks the usual expectations of quiet nerdiness and opts instead for the usual trappings of a frat-boy: popped collars, bad beer, and calling everybody “bro”. Despised by everyone, especially other programmers. I’d like to believe that the gender diversity study will prompt more evolved leaders in Silicon Valley to take steps to ensure fairness for all deserving candidates. There are simple steps one can take to level the playing field. Our retained search practice The Good Search and our research practice Intellerati have done extensive work in diversity recruiting and diversity talent acquisition. We help top media and technology companies identify, profile, and cultivate relationships with the best and brightest diverse talent at the senior executive level — well in advance of hiring needs. We develop diversity talent pools uncovering top diverse talent to ensure their light is not hidden under a bushel. Moreover, diversity talent pools also help to off-set the homogenous effect of employee referrals. To become truly diverse, we must reach beyond our own networks to include executives who do not resemble ourselves. For more on diversity, see our posts Silicon Valley Wants Black Coders. What’s The Issue? and Make Your Next C-Level Hire a Woman.